A major donation from John and Mary Brock enabled the design and construction of this facility. This fast paced project took just under a year to design and construct in time for the Georgia Tech Football 2011 Season. 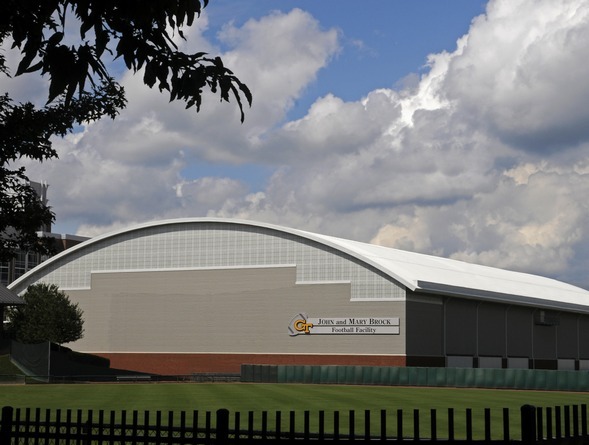 The 88,000 square foot facility has six hydraulic doors, each 30 feet wide by 12 feet tall, that connect the indoor field to the exterior field. The entrance on Cherry Street leads to a viewing platform 12' above the practice field. Cameras are mounted on the North and South ends of the building and controlled remotely on the east wall. A viewing tower at midfield lets the coach get an elevated view of practice on both the indoor and exterior field. Construction was completed by Barton Malow, Inc., and May, Moeller, Purcell Construction Co.